Why is Jill Stein demanding recounts in three states: Michigan, Wisconsin and Pennsylvania? Is she suffering a bad case of Post Traumatic Election Candidate Stress Disorder, aka PTECSD? Stein was the Green Party’s presidential candidate this year. She received less than 1% of the vote nationwide. In some states, Stein wasn’t even on the ballot. Her campaign reported spending a mere $3.5 million on her behalf. Closer to home, in Maryland, Stein only got 31,829 votes for president. Meanwhile, the Green Party’s candidate for U.S. Senate in Maryland, Margaret Flowers, a darn good and solid candidate, rang up 78,752 votes, more than twice Stein’s total. The popular Chris Van Hollen (D) won that race with 60 percent of the vote. Stein has raised an estimated $7 million for the recount process. Many election law analysts are insisting that it doesn’t have a chance in hell of changing the outcome. A lot of that money will undoubtedly go to the lawyers fighting the battle with various state election officials. Now, we’ve learned that the Democratic loser, Hillary Clinton, has joined in the effort. On the surface, Stein, whether she knows it or not, is now coming across on this issue as a stalking horse for the Clinton brigade. Is that good for her and/or the future of the Green Party? There are some whacky suggestions out there in election land, that the presidential results may have been hacked! One clique is even blaming it on the – Russians! Talk about conspiracy theories! Give it a break, will you? I support our Republic having third parties. I would love to see the Green Party, a progressive organization, grow into a formidable political force and genuinely challenge the power of the Duopoly: the Democrats and Republicans. The Green Party needs a lot of work building their electoral base. Receiving less than 1% of the vote in the 2016 presidential election is not encouraging. 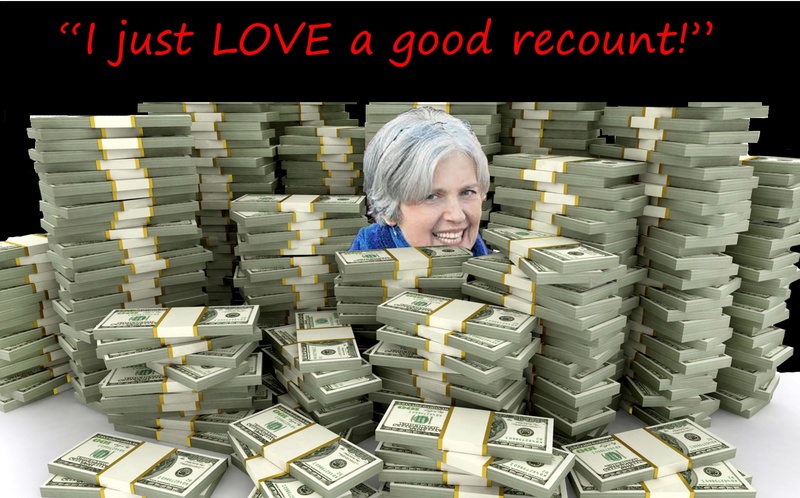 Query: Wouldn’t that estimated $7 million Stein intends to spent on this recount foolishness be better spent on firming up the Green Party’s foundation? At press time, Green Party officials are defending Stein’s actions. Check out the website that she has set up for her fundraising recount efforts. As for “The Donald,” he called it a “scam.” No surprise there. Although Stein’s actions in this arena are baffling to say the least, Clinton’s are more transparent. The bitterly selfish candidate from New York state doesn’t care how much further she will divide our country. The 2016 election is over. It’s time for the nation to heal and for those who rejected Trump’s candidacy to come together and form a cohesive party in opposition. That is how the Brits do it. At the end of the day, this recount brouhaha will end up as a footnote. As for Stein, she will be remembered, not for polling less than one percent of the vote, but for unnecessarily prolonging the trauma of a bitterly-won presidential election. UPDATE NOV. 30, 2016: Green Party Senate candidate for Maryland Margaret Flowers has penned a response to Jill Stein’s recount. Members of the Green Party are distancing themselves from Stein’s actions and asking the GPUS to do the same. President-to-be Trump is right. This is a scam!! !